'Food, Inc.' Director Robert Kenner How much do we really know about the food we buy at the grocery store? 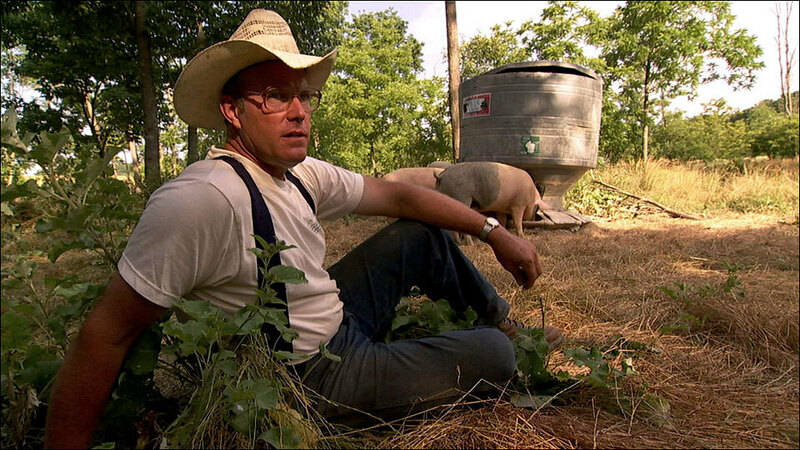 Filmmaker Robert Kenner talks about his documentary, Food, Inc., which is up for an Oscar. The film raises questions about the safety of our food. 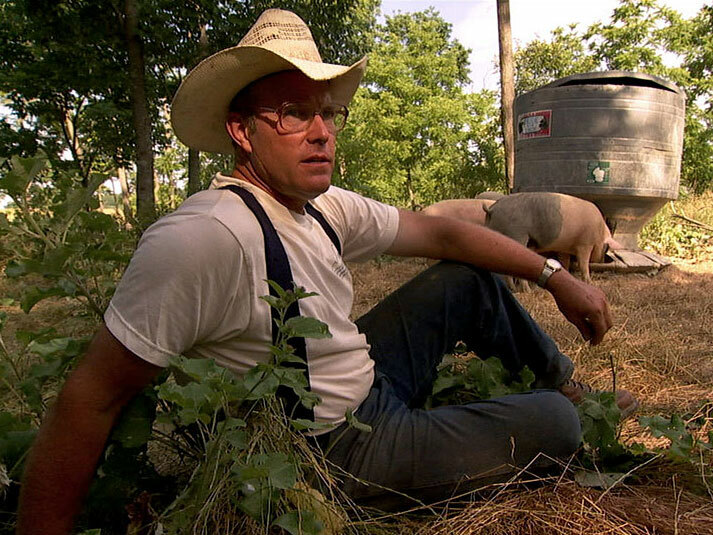 Polyface Farms' Joel Salatin is an organic farmer and an agribusiness critic featured in Food, Inc.
How much do we really know about the food we buy at the grocery store? Filmmaker Robert Kenner talks about his documentary, Food, Inc., which is up for an Oscar. The film raises questions about the safety of our food. Kenner likens the whole supermarket to fast food — efficient and inexpensive. That model is supported by what he calls "very high, unseen costs," that we're just beginning to understand. However, Kenner sees hope in organic farmers like Joel Salatin, and even Wal-Mart, which listened to consumers when it stopped using the growth hormone rBST for dairy cattle. "And we as consumers," he tells host Neal Conan, "have to know we can have a voice in changing the system." In the run-up to the Oscars this year, we're taking a look at the films nominated for best documentary. Last week, we talked with Daniel Ellsberg about "The Most Dangerous Man in America." Today, a picture one critic describe as a horror film for the socially conscious, "Food, Inc." Michael Pollan, who wrote "Omnivore's Dilemma" and Eric Schlosser of "Fast Food Nation" tell us that food has changed more in the past 50 years than in the previous 10,000. Among their examples: industrialized chicken. Mr. RICHARD LOBB (Director of Communications, National Chicken Council): In a way, we're not producing chickens. We're producing food. It's all highly mechanized, so all the birds coming off those farms have to be almost exactly the same size. What the system of intensive production accomplishes is to produce a lot of food on a small amount of land at a very affordable price. Now somebody explain to me: What's wrong with that? CONAN: Well, award-winning filmmaker Rob Kenner spent more than six years talking with farmers, families, food industry workers, and with the few industry representatives who agreed to speak with him, like Richard Lobb of the National Chicken Council, who you just heard. If you'd like to talk with the director of "Food, Inc.," give us a call: 800-989-8255. Email us: talk@npr.org. You can also join the conversation on our Web site at npr.org, click on TALK OF THE NATION. We've also posted clips from the film and a link to watch segments from the other documentary nominees that we're going to be talking about. Again, npr.org, click on TALK OF THE NATION. Robert Kenner joins us now from member station KPCC in Pasadena. Nice to have you with us today. Mr. ROBERT KENNER (Director, "Food, Inc."): Delighted to be here, Neal. NEAL: And you begin with a big idea, and I think that's that the fast food industry has played an enormous part in shaping the entire food industry, the industrialization of food. Mr. KENNER: Ultimately, this is a story about how the whole supermarket has become like fast food. It's become industrialized. It's a very efficient form of food production. It makes for very inexpensive food. It's wonderful on that level. We spend less of our paycheck on food today than we probably have at any point in history. The problem is that this food comes to us at a very high, unseen cost. And we're just beginning to understand those costs. CONAN: And those costs include government subsidies for things like cheap corn. And one of the things that people might be surprised at is the number of products that corn winds up in. Mr. KENNER: Corn is in - corn and soy are in 90 percent of the items, approximately 90 percent of the items that we find in the supermarket. And one of the problems is that we're now eating tremendous amounts more of sugar and salt and fat each day in processed foods. And Americans are now consuming 300 more calories per day than they did about 20 years ago, and we're now - 2/3 of us are either overweight or obese. And this is leading to all sorts of health problems. So this new food system that we've created is - unfortunately, there are consequences that are coming along with this cheap food. CONAN: And I have to say, you not only portray horror stories, but you also look at alternatives that you argue are viable. And, indeed, you present an example toward the end of the movie where you say that, for example, Wal-Mart should not be seen as necessarily the enemy, but a place for - an avenue for change. Mr. KENNER: Well, it was interesting, Neal, because we tried to have this film be a conversation amongst all the producers of our food system, from organic farmers like Joel Salatin, who grow wonderful food. And there are many wonderful farmers in this country who are - farmers who are growing wonderful food. There are many, many wonderful farmers. But by the time we were finishing the film - also, and I got a call from Wal-Mart, saying they would like to be involved. And I was, like, stunned, because we'd been turned down by dozens and dozens and dozens of companies. And the voice of Richard Lobb was one of the very few people from the industry who was willing to speak with us. And so when Wal-Mart did come, I was very happy. I had no idea how we were going to use them in the film. But when they announced to us that they were no longer going to be using the growth hormone rBST for dairy cattle - it makes the cattle produce 20 percent more milk - and they were going to eliminate using rBST because their customers didn't want it, it made me realize that it gave a voice to customers to know that we can help change this food system. I mean, on one level Wal-Mart is probably as responsible for the industrialization of the food system as any company. But at the same time they are also listening to consumers. And we as consumers have to know we can have a voice in changing the system. CONAN: Let's get some callers in on the conversation. 800-989-8255. Email us: talk@npr.org. Daniel, we'll begin with you in San Francisco. DANIEL (Caller): Yeah. Actually, I just watched the movie a couple of weeks ago. And I was really looking forward to it. I'm pretty informed about the, you know, situation with the food supply. I was sort of surprised, actually, that you didn't show any depictions of the finishing lots for the cattle, which, you know, as you probably know, are pretty scary. CONAN: By finishing lots, you mean where they're slaughtered. DANIEL: No. They go from the feed lots to finishing lots, which are sort of like, you know, garbage dumps, basically. And the cows end up eating, you know, all kinds of horrible, horrible things just to kind of beef them up right before slaughter. CONAN: Ah. Okay. Well, let's - Robert Kenner? Mr. KENNER: Well, one of the things that we did in this film is - I didn't want to make a film where people have to have their eyes closed the entire time. I really wanted to make a film that both - sort of delightfully distressing, if you will, so that we can - you can enjoy going to watch it and at the same time wakes people up to how our food system has been totally transformed and how ultimately we have to figure out how to take it back. And I - we had lots of footage of things you just don't want to look at and it certainly makes you less interested in eating industrial food. But I think it's a whole way at looking at a system that has gone off-track. And there are many things I could have included and ultimately we had to pick just a finite number. CONAN: Daniel, thanks very much. CONAN: And I wanted to follow that up. You make a film that - it has brooks no - it's an argument. It's - it takes - it's an advocacy position. Yet you did try to make it entertaining and you certainly made it tight, 93 minutes. You must have put an awful lot of good material on the cutting room floor. Mr. KENNER: There was a lot that we left out. But ultimately we have many different, you know, sort of connecting the dots to show how this brand new system, what we call conventional food, has really only been round 40, 50 years. And as we start to study this system, we begin to realize and we start to see the results of the system - something is gone wrong. And I was asked a question - if this food's so bad, why are we living longer than ever? And the real answer is that this new generation will not be living as long because of this food. But there are alternatives and there are ways that we can get to better food. And I think those - this "Food Inc." plays into a much a larger food movement and it's really growing. And I've been - you know, I've been amazed by how much reaction there's been both to this film and to the entire movement, and we've been to Washington and there seems to be a lot of change in the air and we're very excited about it. CONAN: Let's go next to Peggy, Peggy calling from Charlotte. PEGGY (Caller): Yeah. Hi. Well, commenting on the previous caller about the part where - I don't know if that was you or not where you - where the guy was scraping the E. coli out of the cow's stomach. Was that you? PEGGY: That was gross enough. But I was going to say - I was wondering, do you know what happened to the farmer in Indiana who was getting sued by Monsanto? CONAN: Didn't the film say that they reached a settlement? Mr. KENNER: Mo is - Mo settled and basically is out of business. Mr. KENNER: He's been financially very much impaired. And he -ultimately, he broke Monsanto - well, I don't really - because of different veggie libel laws, it's a little difficult for me to comment too much on it. But Mo is in difficult shape at this point. PEGGY: Well, maybe on your Web site you could get together a donation page for him. PEGGY: Okay. Terrific. Well, thanks a lot. I really enjoyed the movie. CONAN: Robert Kenner, let me ask you. How important is it - would it be, to win the Oscar? Mr. KENNER: Well, I think it would be wonderful because it helps shine a spotlight on an issue that means so much to me. And ultimately, I think, you know, what's really interesting is that "Food Inc." for me, it goes beyond food. As I went through the story and I realized I met with people - well, one of the stories I followed was whether we should be labeling cloned meat. Mr. KENNER: And when that representative from the meat industry said, you know, I think it's too confusing for the consumer to give him this kind of information and we should leave the information of whether the meat's cloned or not off the label, and I realize this is happening time and time again. And I think this is as much a movie about our rights as it is about food. And winning the Oscar just helps to highlight that point. CONAN: Well, should it win because it's a good issue or because it's a good movie? Mr. KENNER: It should totally win because it's a good film. And I think that's really important. But at the same time, it would help highlight the issue. But I totally believe that films should not win because they're about important issues. CONAN: And how does this process work? Who gets to vote on the documentary film category? CONAN: Of all the nominated films? Mr. KENNER: Of all five. And you have to see all five to be able to vote. And you have to see them in a theater, not on DVD. Mr. KENNER: So it - yeah. So it's really complicated. A lot of people have seen "Food, Inc." We became one of the 20 most successful documentaries. And now, after we went on "Oprah," we were the number one document - number one movie in America on Amazon, selling on Amazon, for a number of weeks. We certainly experienced the "Oprah" bounce there. Mr. KENNER: But if people are in the Academy and have just seen our film or have seen four of the films, they cannot vote without having gone to the theater to have seen all five. You can sign an affidavit saying you've seen "Food, Inc." or whatever film, that you've seen it in a theater. And I think that's acceptable. But you have to do that at the theater when you're seeing one of the other films. CONAN: Well, thank you. And we wish you the best of luck. We'll be watching on Oscar night. Mr. KENNER: Thank you so much, Neal. CONAN: Robert Kenner joined us from member station KPCC in Pasadena. He's an award-winning filmmaker, served as producer and director of the Oscar-nominated documentary "Food, Inc.," co-produced by Eric Schlosser, Richard Pearce and Elise Pearlstein. You can watch a couple of clips at npr.org, click on TALK OF THE NATION. The new documentary Food Inc. takes aim at corporate giants behind the U.S. food supply. As director Robert Kenner and food advocate and author Michael Pollan tell Steve Inskeep, they made the film in order to raise Americans' awareness about where their food really comes from. There are benefits to the current system; as Pollan points out, Americans spend less than nine percent of their income on food — less than any other people in history. But, he adds, the benefits have come "at an exorbitant cost, because the system depends on cheap fossil fuel to work. The system depends antibiotics to work. The system depends on abuse animals to work. And if people want to pay those costs for cheap food, that's great, but let's tell them about the costs first."